EncKey is encrypted with the asymmetrical RSA-OAEP algorithm. In order for the browser to decrypt the EncKey , the user must enter the master password. The master password is known only to the owner of the passwords. It is not saved on the computer, so it can't be stolen from it. Immediately after decryption of the EncKey, the entered master password is deleted from the computer's memory. The EncKey is not mathematically associated with the master password. This means that the resistance of EncKey to brute force attacks is constant (matching a random 256-bit number) and does not depend on the complexity of the master password (the length, use of dictionary words, or character set). An outsider who gets access to the computer will not be able to use the passwords. Loss or theft of the password database does not mean that all the passwords must be changed immediately. Neither Yandex nor anyone else will be able to access the passwords during syncing. Passwords in storage are more secure. Even if malware can steal the encryption key, it can't use it, because access to the key is locked by the master password. Tip. If the user has a master password, they can force changing the encryption password and re-encrypt all the passwords in the database. To do this, the user just needs to disable and re-enable the master password. The user initiates the creation of a master password. The browser uses the OS random number generator to create a 256-bit EncKey. For the EncKey, the browser generates a random key_id that is not mathematically associated with the EncKey. The key_id is stored in every entry in the password database. If the user enables password encryption on multiple unsynced devices, they might end up with several different EncKey keys. When syncing and combining the passwords, key_id makes it clear what is encrypted by which key. The browser uses the EncKey to encrypt passwords with the symmetric AES-256 algorithm in GCM mode. The same key is used for decrypting the passwords from the storage. For cryptographically secure protection of the EncKey, the RSA-OAEP asymmetric encryption algorithm is used. To do this, the browser generates a key pair: public (PubKey) and private (PrivKey). The EncKey is encrypted using the public key, and can only be decrypted using the private key (PrivKey). Change the master password without changing the EncKey. Create a copy of the PrivKey with a different passphrase and use it for backup access to the storage. Add passwords to the database without asking for the master password (for example, when syncing encrypted password storage with unencrypted storage, the unencrypted passwords can be encrypted using an additional generated EncKey1 key). To protect the PrivKey from unauthorized use, it is encrypted with a passphrase using AES-256-GCM. Asks the user to enter the master password. Adds a salt and the key_id to the master password. Processes the result 100,500 times with the PBKDF2-HMAC-SHA256 hashing function. As a result, the master password chosen by the user is transformed into the 256-bit UnlockKey. The resources required to hack this key are comparable to the resources needed to hack the EncKey. Note. The field of crypto analysis continues to develop, and researchers are discovering faster ways to crack hashes. This is why the browser's hashing mechanism is not tied to a specific hardcoded function. If necessary, we can easily replace PBKDF2 with a more cryptographically secure function. If the user needs to save a new site password, the browser decrypts the EncKey, uses it to encrypt the new password, and sends the encrypted password to the password database. The user must save a new password. The browser requests the master password (mPwd) from the user and generates the UnlockKey. The browser uses the UnlockKey to retrieve the PrivKey. The browser uses the PrivKey to decrypt the EncKey. The browser uses the EncKey to encrypt the password and send it to the storage. After this, the master password and the password entered by the user are deleted from the computer's memory. Enter the password in a form on a site for authorization or to change the password. The browser uses the EncKey to decrypt the password. When you fill in an authorization form, the browser decrypts the password and inserts it into the form. Then it deletes the decrypted password from the computer's memory. The EncKey is not mathematically associated with the master password, so to change the master password, just change the UnlockKey passphrase that locks the PrivKey. The EncKey doesn't need to be changed. Note. There is no technical reason that prevents generating a new EncKey, but it's inadvisable. By changing only the UnlockKey, we avoid the difficult, risky and lengthy process of re-encrypting the entire password database, which would be inevitable if we changed the EncKey. The browser prompts the user for the current master password (mPwd) and generates the UnlockKey. The browser uses the UnlockKey to decrypt the PrivKey. The browser asks the user for a new master password (mPwdNew). The browser uses the new master password (mPwdNew) to generate a new key (UnlockKeyNew) and uses it to re-encrypt the PrivKey. The user might forget the master password. In this case, you need a way to restore access to the password store, but in a way that is not available to anyone except the user. The master password is only needed to decrypt the PrivKey, so to access the password store, it's enough to have a copy of the private key. The task of restoring the master password is simply a matter of securely storing a copy of the PrivKey. The recovery key (RecoveryPrivKey) is the copy of the private key. Some password protection systems offer the user to print out the recovery key (or QR code). We don't consider this approach to be secure enough, because the printout could be stolen or lost. Our solution is to encrypt the recovery key, store it on your device, and store the decryption key (RecoveryUnlockKey) separately from it on the Yandex server. In order to get the key from the server, the user must verify their identity by manually entering the password to their Yandex account. Storing the recovery key and password separately means that the master password can be reset without introducing additional vulnerabilities. If the user forgot the master password, they can request the password from the recovery copy of the private key. The browser decrypts the RecoveryPrivKey and then encrypts it with a new master password invented by the user. Access to the password store is restored without having to change the EncKey and re-encrypt passwords. The user agrees to create a key for resetting the master password. If the user is not logged in on Yandex, the browser asks them to log in. The browser generates a random 256-bit key (RecoveryUnlockKey) and saves it in the user's account on Yandex. The browser generates the RecoveryPrivKey. To do this, it makes a copy of the decrypted PrivKey and encrypts it using the RecoveryUnlockKey as a passphrase. The browser stores the RecoveryPrivKey in the browser profile on the device. In the future, this key is stored only on the user's device and is not uploaded to Yandex servers during synchronization. To enable the user to recover access to passwords from other devices, the browser sends the EncryptedRecoveryPrivKey to all the user's devices during synchronization. This is a copy of the RecoveryPrivKey that is encrypted with the UnlockKey. As soon as the user syncs another device with the Yandex server, the EncryptedRecoveryPrivKey is sent to this device and stored there in encrypted form. When the user enters the master password (mPwd) on another device for the first time after syncing, the additional encryption is removed from the EncryptedRecoveryPrivKey. It is transformed to the RecoveryPrivKey, which is protected by the RecoveryUnlockKey. The RecoveryPrivKey is stored on the device and never synced in unencrypted form. The user can use it to reset the old master password and create a new one after getting the RecoveryUnlockKey from the account. Attention. The user can reset the master password only if a recovery key was previously created. They can reset the master password either on the device where the recovery key was created, or on a device where a copy of the EncryptedRecoveryPrivKey was received after syncing and decrypted (in other words, the user successfully entered the master password on this device at least once after syncing). The user initiates the master password reset. If the user is not logged in on Yandex or logged in more than five minutes ago, the browser asks them to confirm their identity by entering the password from the Yandex account. This prevents a situation when someone else could use the device to reset the master password in the user's absence. Note. For this authorization, the password can't be inserted automatically. If the user does not remember the password from their Yandex account, they will not be able to reset the master password until they restore access to the account. The browser asks Yandex.Passport for the RecoveryUnlockKey and gets it if authorization was successful. The browser uses the RecoveryUnlockKey to decrypt the RecoveryPrivKey. Then the RecoveryUnlockKey is immediately deleted from the device's memory and from the user's account on Yandex. The browser uses the new master password (mPwdNew) to re-encrypt the PrivKey and creates a new UnlockKey. 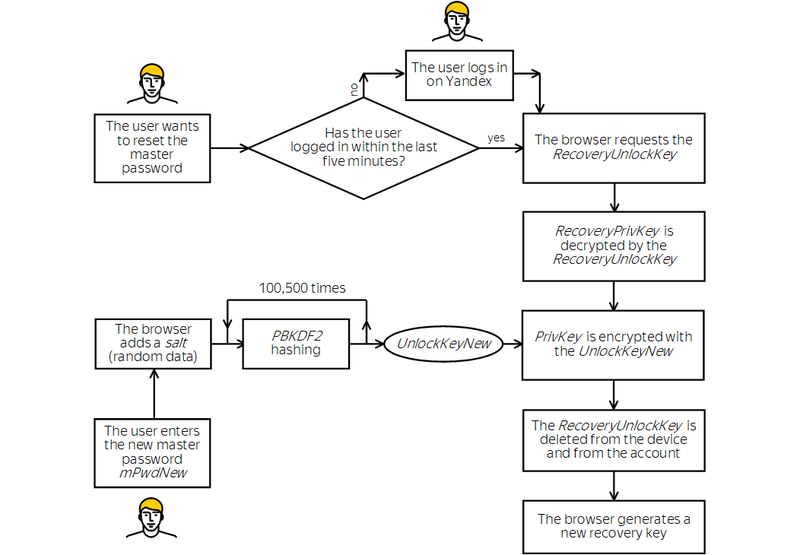 The browser generates a new recovery key (RecoveryPrivKeyNew) and sends it to the Yandex server. 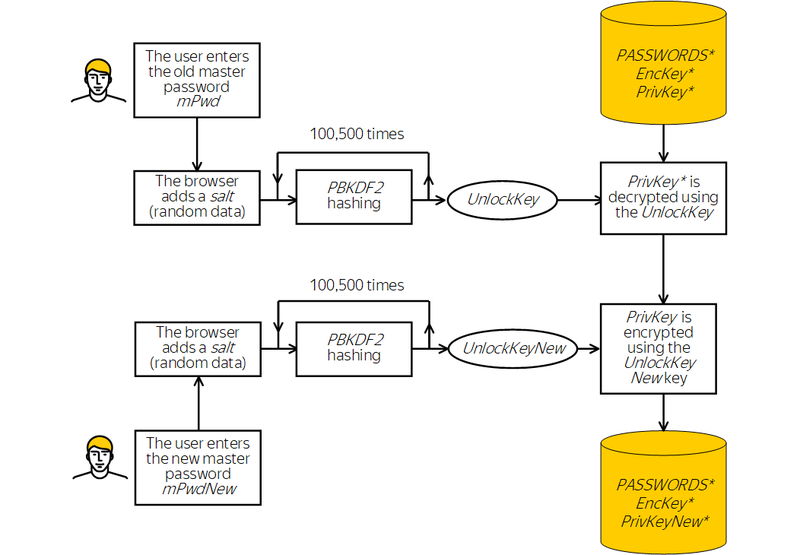 The encrypted private key (PrivKey). The password store with the private part (passwords and notes) encrypted. The encrypted recovery key (EncryptedRecoveryPrivKey), if it was created. Note. The UnlockKey is not sent to the server and is not stored on the computer. It is calculated each time the user enters the master password. The HTTPS protocol protects the data transmission overall. Use of GСM protects the public part of entries from substitution. The encryption used by the browser protects the private part of the password store. The encryption key is protected by a master password, so no one (not even Yandex) can decrypt it. Therefore, Yandex servers store the addresses of websites and usernames on these sites in unencrypted form, but passwords, notes, and EncKey encryption keys are stored in encrypted format. Additionally, information necessary to decrypt it is not uploaded to Yandex servers. The recovery key (RecoveryPrivKey) is created on the device and stored on it in encrypted form. This key can't be simply left on the device where it was created, because the user could lose the device and would not be able to restore access to passwords. Creating a recovery key on each device manually is also not a good solution, because the user might end up with a device where they forgot to create the key. Transmitting the key to other devices via synchronization isn't safe, because the password for the key is stored on the Yandex server. To solve all these problems, additional encryption is applied to the RecoveryPrivKey with the UnlockKey. Decrypting the UnlockKey requires the master password, which isn't stored anywhere, so the resulting EncryptedRecoveryPrivKey can be safely synced. After synchronization, the additional encryption is removed on each synced device when the master password is first entered correctly with the EncryptedRecoveryPrivKey. The restored RecoveryPrivKey remains encrypted by the RecoveryUnlockKey. The latter is stored in the user's account on Yandex and can be obtained only after the user manually enters the account password. A copy of the RecoveryPrivKey is stored in the browser profile on the device. In this way, the user can restore the master password from any synced device if they entered the master password on the device at least once after synchronization. However, the recovery key remains secure during transmission over the network. The browser creates a copy of the RecoveryPrivKey and encrypts it with the UnlockKey. During synchronization, the resulting copy (EncryptedRecoveryPrivKey) is sent to the Yandex server. The RecoveryPrivKey is stored on the device and never synced in unencrypted form. By getting the RecoveryUnlockKey from the account, the user can reset the old master password and create a new one.